Temaki (hand rolls) offer a delicious alternative to regular sushi. Consisting of a large cone-shaped piece of nori, filled with a variety of fresh ingredients, the hand-roll is the ideal lunch-time snack. Unlike some sushi dishes, the hand-roll is rather filling and should sustain you for the remainder of the afternoon without weighing you down. Its name derives from the words te (hand) and maki (sushi rolls which contain nori).Temaki sushi is extremely popular in Japan. Although rarely found at formal restaurants, most sushi takeaway outlets prepare them – they’re also very popular additions to private sushi parties. In addition to the health benefits, hand-rolls provide the perfect introduction to Japanese cuisine as they fuse both Japanese and Western ingredients. A sushi chef prepares Temaki by placing a small amount of sushi rice on a sheet of nori, which is sometimes cut to a more manageable size. Neta (filling) is then added to the rice and the nori is then rolled into a tight cone. Chopsticks can prove cumbersome so it’s often more convenient and quicker to eat with the hands. This also ensures that the nori doesn’t absorb the ingredients and go damp by sitting too long. All kinds of neta can be used to fill hand-rolls. Popular fillings include fresh fish, tempura vegetables, tofu and fried eggs which can be dipped in a variety of sauces such as wasabi, ponzu or soy sauce. Unsurprisingly, hand-rolls have become the go-to snack for many a Londoner with countless sushi delivery outlets offering their carefully crafted creations to the hungry lunch-time droves. Here’s our own selection of Temaki hand-rolls to whet your appetite. Our ever-popular, spicy prawn temaki is first up. Prepared with tiger prawns, diced spring onion and avocado, the roll is then filled with chillies and spicy mayonnaise – perfect for adding a zing to your lunch-time snack. Another popular hand-roll amongst our customers, our Hoisin Temaki includes shredded duck with toppings of sliced cucumber, avocado and a helping of Hoi-Sin sauce. This is one of our best-selling seafood rolls and includes crabstick and avocado with a touch of flying fish roe and spring onion. Our spicy tuna roll offers a simple, delicious and convenient snack for busy people who are constantly on the go. The roll features diced spring onion, cucumber and chillies which are then topped with our special spicy mayonnaise. Delicious flying fish roe is also used with our soft shell crab temaki. Avocado and spring onion are also added which really compliments the overall flavour. The above five rolls are among our most popular lunch-time snacks. As you can see, each one features ingredients that really enhance the overall taste experience. Here’s a quick run-down of some of the ingredients mentioned above and how they are prepared for each hand roll. Tobiko consists of Flying Fish eggs and is widely used in the preparation of sushi. It has a crunchy texture and often comes in vibrant colours such as orange and red. It’s a delicious, salty addition to any sushi dish. Mayonnaise is not a traditional ingredient but is nevertheless a popular topping in the West. Our spicy version is made with traditional mayonnaise but with the addition of Sriracha hot sauce and lime juice – it goes particularly well with spicy tuna. Our crab stick is a kind of Kamaboko (cured paste), made from pulverised white fish flesh and then shaped to resemble crab leg-meat. They’re used in a variety of sushi rolls such as the Californian and our own special Crabstick and Avocado Temaki. Although not included in the hand-rolls above, our menu does feature this tasty ingredient. Also known as bean curd, Tofu is included in dishes throughout the Far-East. The Japanese version which is known as Aburage, is often thinly sliced and deep-fried. It can prove very effective at taking the sting out of some of the more potent flavours often found in sushi dishes. So that’s the run-down of our five lunchtime best-sellers – if you’re looking for the best sushi in central London, then pay us a visit. We don’t think you’ll be disappointed! YouMeSushi also specialise in sushi delivery in London and the surrounding areas. Our branches can be found at Marylebone, Westfield, Grays Inn and Tottenham Court Road. 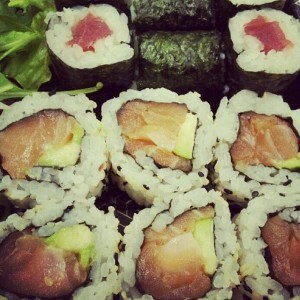 This article was posted in Healthy Eating, Learn About Sushi, Sushi Delivery. Bookmark the permalink.